SuChin Pak is a South Korean-born American television news correspondent, frequently appearing on the cable networks of MTV. 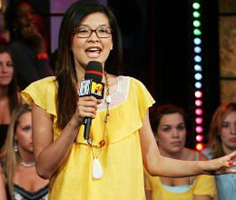 SuChin Pak joined the MTV News Team as a correspondent in May of 2001. She has covered the MTV Movie Awards, the Sundance Film Festival, and the MTV Video Music Awards. She also co-hosted, with Kurt Loder, the MTV's pre-Grammy show. As a correspondent for "MTV Daily News", she has interviewed Mariah Carey, *NSYNC, P. Diddy, George Lucas, Jane's Addiction.... Pak hosted her own MTV documentary about multicultural young people called My Life (Translated). She currently narrates MTV Cribs as well. Born in Seoul, South Korea, Pak immigrated along with her parents to California when she was five years old. She grew up in Union City, California, a suburb southeast of San Francisco. Her parents own a small restaurant in downtown Oakland, California. Pak never planned on a career in television. While attending James Logan High School, she volunteered for Youth in Government, an organization aimed at involving and educating young people in the political process. She was also a member of the school's forensics team, in which she did expository speaking. In 1992, she placed 8th in the state of California. She was interviewed for the news by KGO-TV, the ABC affiliate in San Francisco for the show Straight Talk 'N Teens. The program director for another station happened to see the piece and approached her to host the teen-based magazine show First Cut on KRON, the then-NBC (now MyNetwork TV) affiliate in San Francisco. This "after-school job" became Pak's introduction to the entertainment world. Her first big interview for the show was Ice-T. While attending the University of California, Berkeley as a political science major, Pak was once again discovered, when the producer of a PBS science show called Newton's Apple saw a tape of her. Following graduation, she was approached by ZDTV (first changed to TechTV, now called G4), a cable network devoted to technology and the Internet. After a year working on Internet Tonight, a daily half-hour show at ZDTV, she was recruited to be a correspondent on KRON. Looking to move on from San Francisco, she sent in a tape to the start-up cable network Oxygen. After a year-long audition process, she was hired as a host for the show Trackers and moved to New York City. From there, MTV spotted her and she was soon the first Asian face of MTV. In 2007 she appeared on The Oprah Winfrey Show, revealing that she has struggled with confidence and beauty issues for many years. She mainly spoke about her epicanthal folds, and explained how her family and other Asians believe a double eyelid is crucial to beauty. She also mentioned how epicanthoplasty is the top form of plastic surgery being done in Asia. More recently, in 2008, Pak had left MTV News for Planet Green to host G Word, which is co-hosted by Daniel Sieberg.